Unless otherwise noted, photographs by George P. Landow. Text by Landow and Jacqueline Banerjee. You may use these images without prior permission for any scholarly or educational purpose as long as you (1) credit the photographer and (2) link your document to this URL in a web document or cite the Victorian Web in a print one. Left to right: (a) Three-quarter view of the west front (b) Closer view of west front. (c) Three quarter view from the other side — this last photograph by John Salmon. 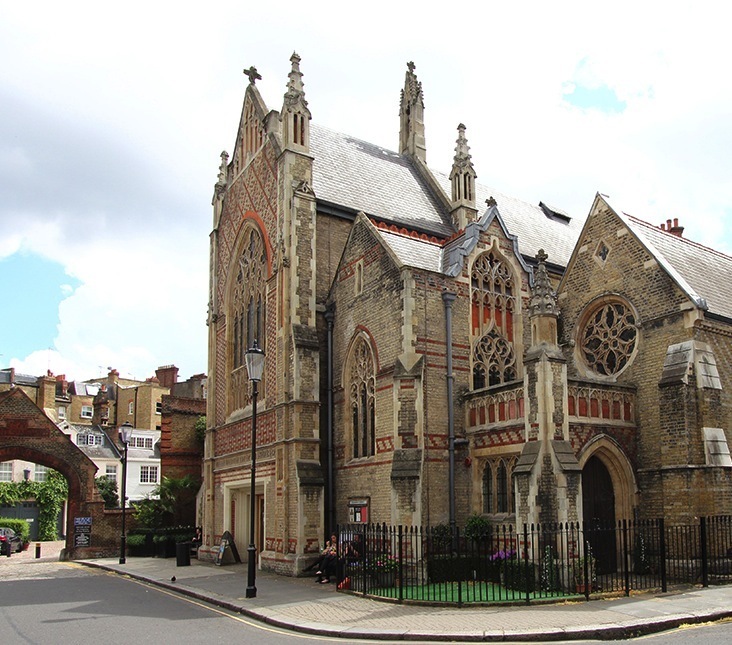 The church, which is in the Early Decorated style of the Gothic Revival, was built on a site given by the Earl of Cadogan, and cost £5000 to build and fit out. Of this, £2000 came from the Commissioners for Building Churches in the Metropolis. Two benefactors are also mentioned in the Gentleman's Magazine report about it: a Mr Sidebottom of Sloane-street, who contributed £500, and a Mr Howe, who gave £200. 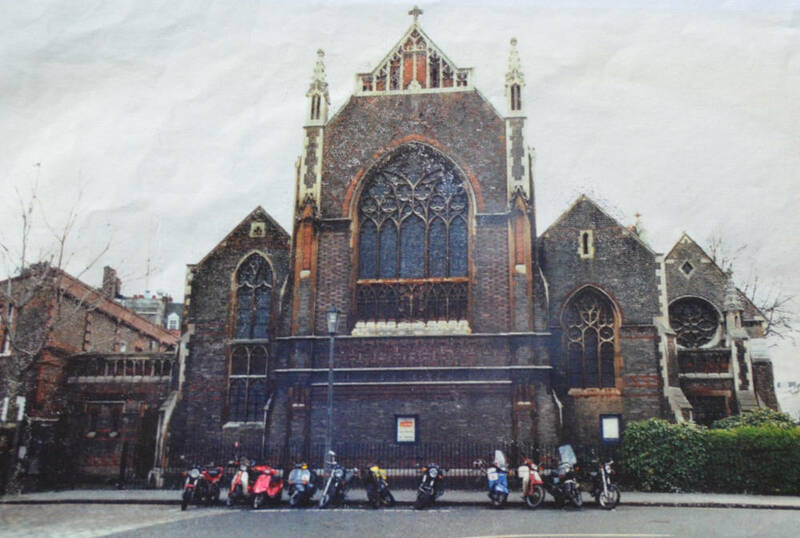 The church, which could hold a congregation of 1,200, was consecrated by the then Bishop of London on 27 May 1840 (see "New Churches," p. 307). Details of the church exterior. Left to right: (a) Traceried gable over west front. 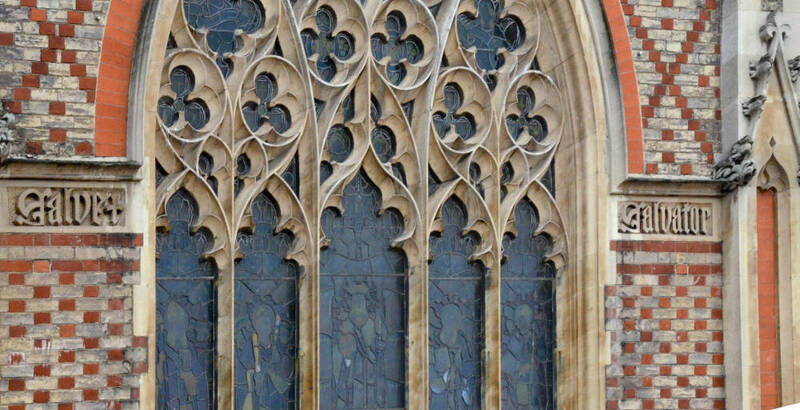 (b) West window tracery. (c) Crocketed pinnacles. However, there have been some radical changes since that time. The North Aisle was added in 1878 by E. P. Loftus Brock. The chancel was designed by Rev. 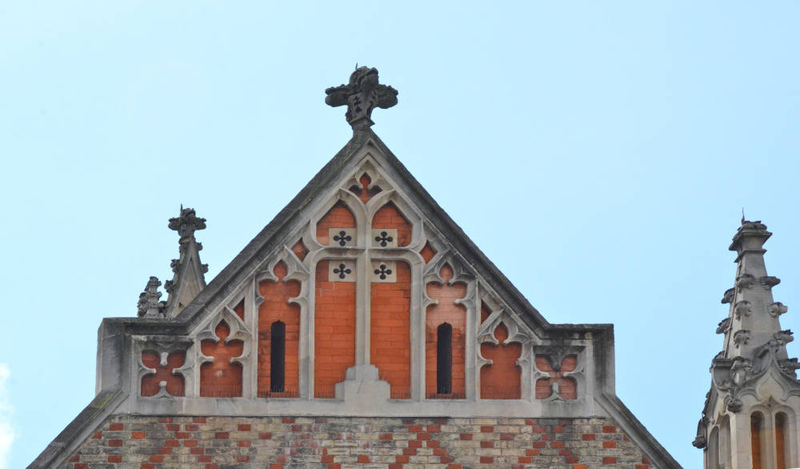 Ernest Geldart (1848-1929), a priest who had set out to be an architect, and had trained under Alfred Waterhouse. 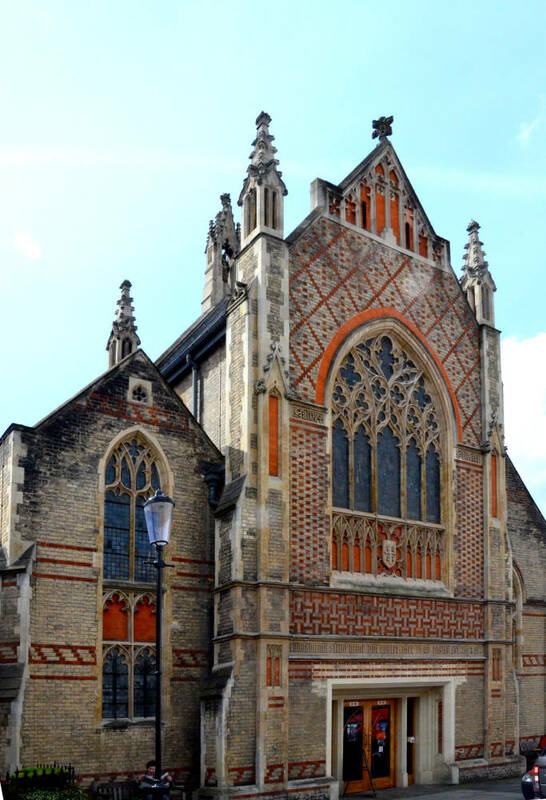 This was completed in 1890, at a cost of £1,710 raised by the parish (see explanatory text). The church was Grade II listed in 1954. In recent times, most of the current structure has been converted to other uses, currently as a high-end luxury residence. 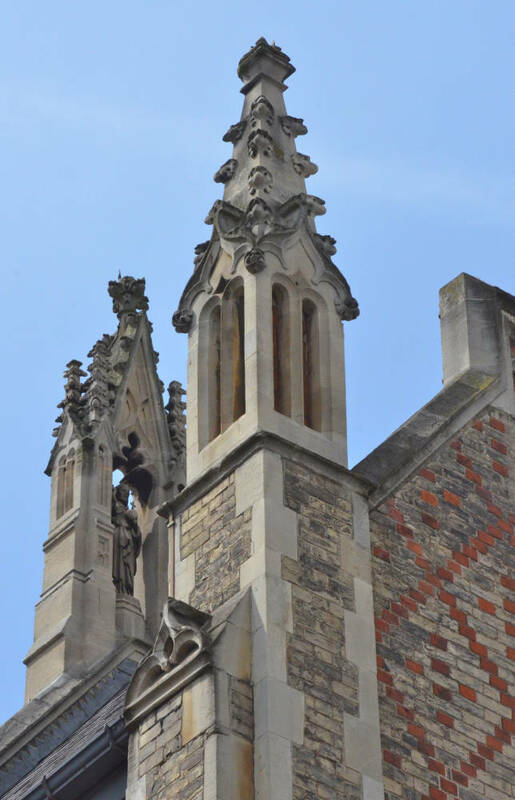 But the present nave, the north chapel at its east end, the high altar, Basevi's pulpit, one Victorian and one early twentieth-century stained-glass window, and other details, such as the corbels, can still be seen and admired here. These photographs are courtesy of Ms. Janine Gillion, who generously explained the history and recent conversion of the church. 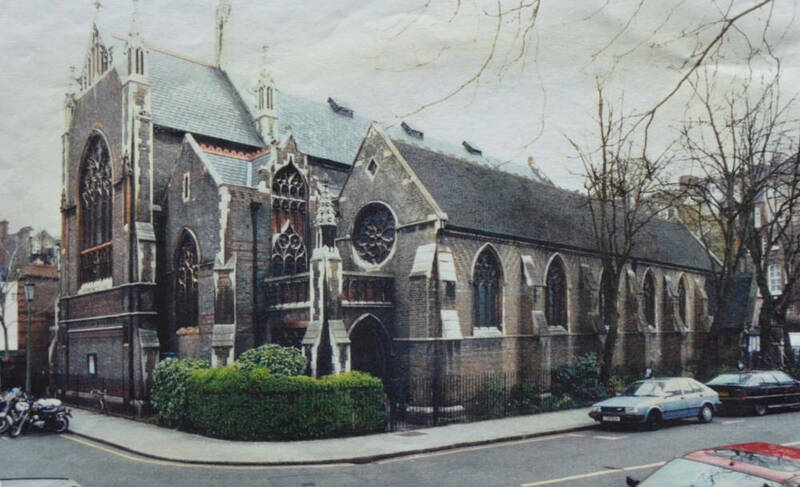 The photograph at left shows that parishioners originally entered St. Saviour's on a side street, the current entrance being a very recent addition. 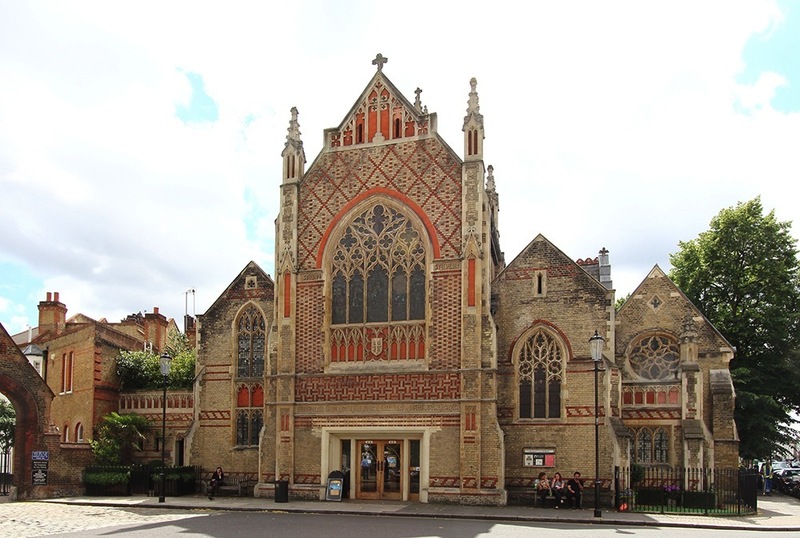 Noting that this church, like nearby St Jude which Basevi designed a little later (1843–4, but destroyed in 1933) is in the Gothic style, Richard John describes Basevi as employing the idiom "competently if rather uninspiringly" when required, but the Gentleman's Magazine finds at least a degree of novelty in the twin spires on the main front ("New Churches," 307), and many people might feel that it has quite a striking appearance. 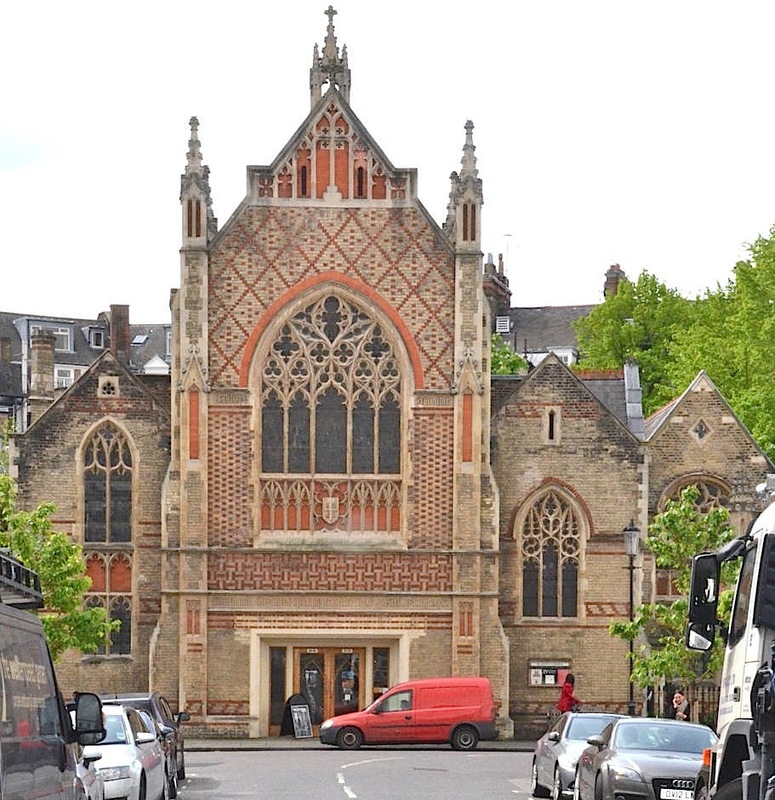 Much of this may be due to Geldart, though, who is credited with "the more flamboyant tracery and diapered brickwork" (Cherry and Pevsner 580). Cherry, Bridget, and Nikolaus Pevsner. London 3: North West. New Haven and London: Yale University Press, 2002. Church of St Saviour. British Listed Buildings. Web. 5 June 2017. Eberhard, Robert. "Stained Glass Windows at St. Saviour (Walton Street), Chelsea, Inner London." Church Stained Glass Windows. Web. 5 June 2017. Explanatory text from a statement in the current building's vestibule. John, Richard. "Basevi, George (1794–1845)." Oxford Dictionary of National Biography. Online ed. Web. 6 June 2017. "New Churches." Gentleman's Magazine, Vol. XIV: 306-08. Google Books. Free eBook. Web. 5 June 2017.